iLocater will be the world's first high-resolution diffraction-limited Doppler spectrometer. It will identify and characterize Earth-like planets orbiting the nearest stars. 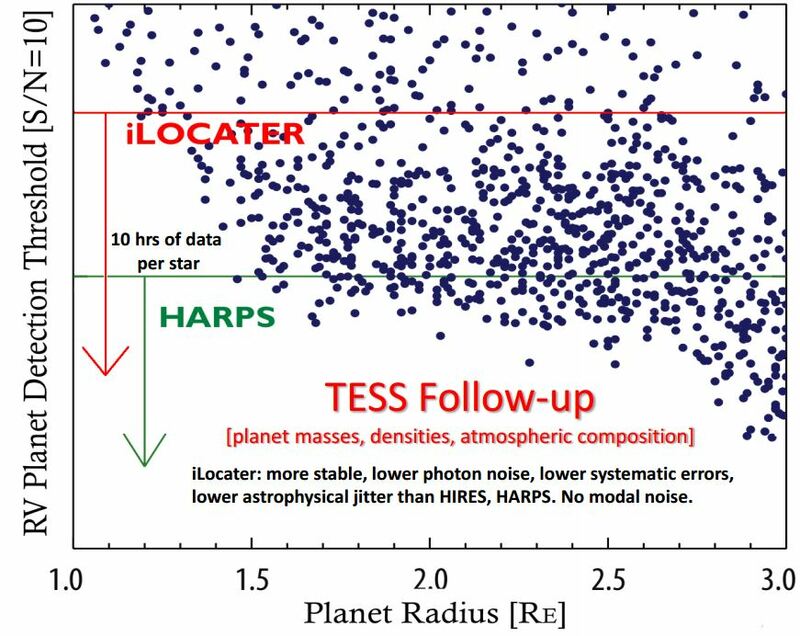 By operating in a new wavelength range, the near-infrared, and simultaneously correcting for image-blurring effects introduced by Earth’s turbulent atmosphere, iLocater will generate ultra-precise radial velocity (RV) measurements that address outstanding questions in exoplanetary science. iLocater will receive a well-corrected beam of starlight from LBTI. With input images that achieve 30 times higher spatial resolution than “seeing-limited” designs (i.e., all radial velocity predecessors), iLocater will simultaneously enable high spectral resolution (R=110,000), high throughput, and a compact optical design at low cost. Compared to present-day Doppler instruments, a diffraction-limited spectrometer will: (1) be significantly easier to stabilize (temperature, pressure), thus leading to higher radial velocity precision; (2) receive three orders of magnitude less background contamination from sky-emission and the moon; (3) employ a single-mode optical fiber to eliminate modal noise, which is known to induce spurious Doppler shifts; and (4) reduce astrophysical jitter arising from spots that rotate with the surface of stars. Further, iLocater will have the unique ability to monitor and ameliorate internal systematic errors by using two separate telescope dishes simultaneously, enabling the first RV measurement precisions below 1 m/s at near-infrared wavelengths. iLocater is a low-risk, high-reward instrument with low power consumption that takes up very little real-estate, complements the suite of current LBTO instruments, and may be easily integrated within the observatory. Hardware deliverables include an acquisition camera mounted to LBTI and stabilized spectrometer fed by long optical fibers; both will be developed on a 3 year timescale. iLocater will become a facility-class instrument available to all LBT consortium users through the standard competitive observing proposal process. An international team of senior scientists representing all LBT partners has been assembled to help design, build, and commission the instrument and contribute observing time to address the aforementioned science cases.